The OSD2524 is an Industrial Managed Layer 2 Ethernet Switch with 20x 10/1000/1000BaseT, 4x RJ45/SFP Combo and 2x 1G Trunk SFP ports. 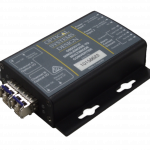 The OSD2524 is temperature rated from -20 to +75°C and is available in one of several powering options, including dual redundant DC powering (10 – 36VDC @ 40VA Max), AC powering and dual redundant AC powering (90 – 264VAC @ 50VA Max). A PoE version is also currently in development and will be released shortly.